Following the enormous success of Volume One (TP094), we are proud to present Volume 2 of Debussy's Piano Music. Roy Howat is an internationally regarded Debussy scholar, having edited many of the works for the recent French complete edition. His performances are in the authentic Debussy tradition, strictly adhering to the score, and thus avoiding the overblown sentimentalism and romanticism of many other performances. Vol 3 - TP164 Preludes Book 2, Estampes and world premiere of "Les soirs illuminés par l'ardeur du charbon"
Tall Poppies is an Australian label, devoted principally to the work of musicians from that continent. Roy Howat is one of Australia’s outstanding musical exports, and it is exciting to have his four volume Debussy series now complete. Howat is not only a fine pianist; he is also a considerable Debussy scholar, having contributed a book to the literature – Debussy in Proportion – plus numerous articles. He is also an editor of the Paris-based Complete Debussy Edition, so he is truly immersed in this music. The result is that his playing has a tangible sense of authority, easily sensed from the very first track of each CD. He has also contributed the exemplary and extensive booklet notes, and it is gratifying to see research and performance interacting in such a creative and intelligent way. One specific example; Howat has noted from Debussy’s own piano roll performance (and other sources) that part of the famous prelude La cathédrale engloutie is printed in note-values of twice the intended duration, and has adapted his performance accordingly. This interests me, in that I had always felt that this piece, wonderful thought is, dwarfed the other preludes, being more than twice the length of most of them, and, listening to Howat's reading, it makes perfect musical sense to do as he has done. A characteristic of Debussy’s that comes over surprisingly strongly in this set is his humour. It’s there not only in such obviously comical numbers such as Général Lavine – excentrique, or Hommage à S.Pickwick esq., P.P.M.P.C, but also, more subtly, in the allusions to other music, such as Handel, Bach and Daquin, all hinted at in quick succession in the finale of Pour le piano. Titles are often deliciously witty too; the lovely La plus que lent, almost impossible to translate, but meaning something like ‘The slowest of them all’ was a wry comment on the fashion for very slow waltzes; while the romantic sounding Les soirs illuminés par l’ardeur du charbon – ‘Evenings lit up by the glowing of coal’ - despite being a quotation from Baudelaire, simply reflects the fact that, in the bitterly cold, war-torn Paris winter of 1917, Debussy received a welcome delivery of coal from a local merchant, then wrote the work as a ‘thank-you’. That piece, receiving its first ever recording, is just one of the numerous rarities which are liberally sprinkled amongst the more famous works. Some are of little consequence, but some are well worth hearing. Vol.2, for example, contains the extraordinary Berceuse héroïque of 1914, a powerful and gloomy work, written in the very early days of the Great War. It has a subtly understated march-like tread, ad its progress is marked by disembodied fanfares. That is followed by the Page d’album, donated to support the work of an organisation called Le vêtement du blessé (The dressing of the wounded), which Howat describes as ‘an exquisite little waltz’, and an interesting Elégie. This would make a good one for a ‘blind’ listening session with friends. The name of George Gershwin is sure to come up much sooner than Debussy’s, as it’s full of lovely jazzy ‘squelches’, and the sort of textures Gershwin employed so effectively in his Preludes. Volume 1 contains the two sets of Images, between which are the two books of Etudes, plus an Etude retrouvée, another of Howat’s discoveries. The first series of Images is arguably where Debussy emerged in his full greatness as a composer for the piano, and the first movement, Reflets dans l’eau, immediately makes manifest Howat’s qualities as a pianist. Here are brilliance and technical bravado in generous measure, but also the greatest sensitivity to the voicing of the music, meaning that there is a transparency to his playing that allows one to hear everything with the greatest clarity. Far from losing the sense of mystery, this actually enhances it, and I don’t remember this music ever sounding more ravishingly beautiful. The central Hommage à Rameau, a delicately sad sarabande, has great dignity and restraint, while the pulsating final Mouvement is powerfully motoric. Then comes the first book of Etudes, in which Debussy, like Chopin before him, uses technical issues as a ‘camouflage’ for intensely poetic music. Here, as in the second book, Howat is an ideal interpreter, making no concessions to the often acute difficulties of the music, yet catching the character of each piece superbly. There isn’t the space to go through all of these; to take one example almost at random, listen to track 6, Pour les quartes (‘For fourths’), in which little bursts of pentatonic orientalism alternate with darker, whole-tone sounds, building up an incredibly rich and allusive tonal picture. And all this so as to practise those nice smooth 4ths! The disc ends with the second series of Images. Here again, Howat is immensely disciplined, so that the precise imagery of the first movement, the wonderful Cloches à travers les feuilles (‘Bells across the leaves’) is etched out clearly, with no blurring of the rhythmic outlines. In his notes, Howat reminds us of Debussy’s insistence, no doubt with errant pianists in mind, that his music must be played "exactly in time". Volume 2 features Book 2 of the Préludes, the early Images oubliées, and the three short ‘war effort’ pieces described earlier. It concludes with an ‘unofficial’ suite, the ‘2nd Suite Bergamasque’ whose inclusion in this form Howat justifies by explaining how the three pieces contained within it were undoubtedly intended as a triptych, even though they were never published as such. It’s a fascinating story, far too long to recount here, but quite convincing given the circumstances, and totally born out by the musical result. The final piece is L’isle joyeuse – ‘Island of joy’, a semi-autobiographical reference to Jersey, where Debussy had eloped with his mistress Emma Bardac . This is surely one of the composer’s high points, a thrilling tour de force. Howat flings himself at this piece in an uninhibited way that captures the spirit of a live performance, building through the final sequence of key-changes to a climax which is only equalled in the composer’s music – not surpassed – by the ending of La Mer. This is inspired, seat-gripping stuff. The Préludes receive equally splendid treatment, with Howat excelling in the rustling textures of Feuilles mortes (‘Dead leaves’) and, at the other extreme, the jagged explosions of Feux d’artifices (‘Fireworks’). Volume 3 contains the Estampes, the first book of Préludes, the suite Pour le piano, and a number of shorter pieces. These are Les soirs illuminés par l’ardeur du charbon described above; the tiny Morceau de concert; the delightful ragtime Le petit Nigar; the witty trifle Hommage à Haydn, in which the eponymous composer’s name is ‘spelt out’ in the musical notation, and, concluding the disc, the wonderful La plus que lente. The Préludes are given performances as imaginative as those of Bk 2 on the previous disc, with tempi that are often surprising on first hearing, but which always make perfect expressive sense. The first one, Danseuses de Delphes, is a perfect example – just a shade more flowing than usual so that the music does indeed dance, with the sustaining pedal used sparingly. Volume 4 contains some of those early pieces which, perversely, sustain Debussy’s popular reputation; the Arabesques, the Suite bergamasque (which of course contains Claire de lune), and THAT Rêverie! Howat plays all of these, as well as the delightful Children’s Corner, as though they’d never been recorded before, and they do indeed come up sounding quite fresh - though I confess I don’t much care for Howat’s over-emphatic articulation of the triplets in the first Arabesque. This is a truly distinguished set of Debussy recordings, worthy, in my view, to take their place amongst the very finest on disc. Not only do they throw much new light on very celebrated music, they also contain much which is hard to find recorded anywhere else. Above all, there is sensitivity and vibrant imagination, allied to a transcendental technique always at the service of the music. The recording is so good that I didn’t even notice it – believe me, that is a sincere compliment, particularly where piano recordings are concerned! These discs are yet another indication of the great music-making with which Australia abounds these days. This is Vol. 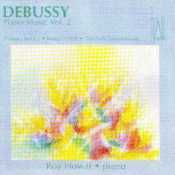 2 of Debussy scholar and pianist Roy Howat's survey of the composer's piano music. It's an interesting selection, most of it familiar but some less so, ranging from the early Images Oubliees (1894) to the three wartime pieces (1914). Howat plays with intelligence and elegance, using the pedal skillfully to produce a variety of nicely shaded tone colors in unmannered performances, with a good sense of form. Still, he is somewhat too delicate, too polite and reserved to evoke the emotional intensity of this music, and many will prefer the greater robustness of Richter in much of it and Zimerman in the Preludes. It is an attractive recital, with Howat's interesting and informative program notes and sound that's a bit too resonant but otherwise satisfactory.